Purified Grade « Global Market Insights, Inc. 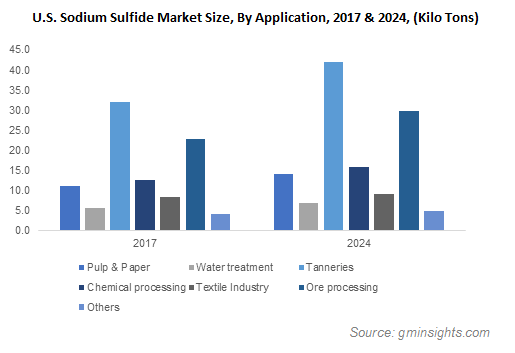 Global sodium sulfide market is anticipated to witness a rather rapid growth over the next few years, owing to the increased disposable income among consumers and the rising demand from different industries such as paper, chemicals, textiles and leather goods. The compound is also utilized across other areas like metal production and water treatment, stretching its application scope to segments that get affected by a population upsurge. The fast-growing construction segment has sustained the consumption of copper, which is used to make numerous parts of a building, subsequently propelling the sodium sulfide industry as the compound is vital in ore processing. Copper is an excellent heat and electricity conductor, besides having other suitable properties, making it ideal for heating systems, power transmission and various aesthetic parts of a building. The sodium sulfide market has benefited from the consistent demand for copper in construction sector throughout the world. A report suggested that the construction market is projected to grow annually at a rate of nearly 4.5% till 2020, a fact clearly supported by the vast population observed in the Asia-Pacific region. Boasting of a strong mining infrastructure and mounting investments in mineral exploration, the region could provide considerable propulsion to the sodium sulfide industry through the production of copper. Essentially, most of the building components made of copper have high levels of recycled content, more than 80% in many cases. The metal is considered to be important for ensuring the energy efficiency of green buildings, an up and coming trend in the construction sector worldwide. Copper is extremely suited for environmentally sound plumbing and wiring, in addition to its uses in bathroom fittings and lighting. The high-conductivity of copper has led to its utilization in advanced occupant monitoring systems and for heat transfer in water heater systems. Intrinsically, the need for improving energy efficiency in buildings will ensure elevated copper demand, driving the sodium sulfide industry growth. Worldwide trends have shown that Europe is moving faster towards sustainable construction, suggesting broader development prospects for the copper industry. Expounding the tremendous opportunities for the consumption of the metal, it is widely used in the manufacturing sector for making parts of automobiles, electronics and many other components. As such, mining companies are looking to expand their production of copper, even though it has already been one of the most mined ores in the human history. Increased ore processing activities to meet the global requirements will also bolster other industries involved in its production, including the steadily booming sodium sulfide market. It was estimated that globally, around 19.7 million metric tons of copper was produced from mines in 2017, with consumption of the element currently standing at nearly 23.8 million metric tons per year. The evidence of a robust increase in the demand and use of copper, and subsequent proliferation of the sodium sulfide market, can be gathered by the efforts of companies like Excelsior Mining, who are seeking the development of new mines. In 2017, the company had received permission by Arizona regulators to open the state’s first copper mine in over a decade, boosting the supply of the element in the U.S. and the state’s own mining revenues. Speaking further, the Arizona mine has a life expectancy of almost a quarter century, signifying consistent copper supply over the coming years. Also, world’s second largest copper producer, Peru, recently launched another new copper mine worth USD 1.6 billion, that would produce 102,000 t/year of copper concentrated with operations starting in 2020. These are only some instances underscoring the extensive requirements of copper ore processing worldwide, which will eventually fuel the sodium sulfide market expansion. Citing another example to demonstrate the industry potential, a Chinese owned firm had, in August this year, started production at a new copper mine in Zambia, with its full capacity set to be reached by 2020. All in all, continuous rise in the production copper throughout the globe, along with other ferrous and non-ferrous elements that are widely used by different industries, will accelerate the sodium sulfide market size in the imminent future. 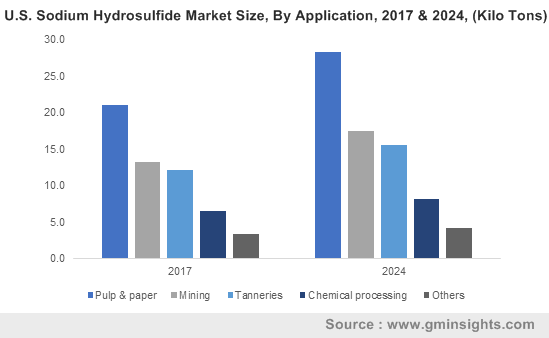 Massive consumption of the compound in paper, textile products and leather goods will also generate substantial revenue for the global sodium sulfide industry, pushing it beyond USD 665 million by 2024. This entry was posted in Bulk & Specialty Chemicals and tagged Anhydrous Sodium Sulfide, Chemical Processing, Crystal Sodium Sulfide, Global Sodium Sulfide Market, Leather Industry, Low Ferric Sodium Sulfide, Ore Processing, Pulp & Paper, Purified Grade, Sodium Sulfide Market, Sodium Sulfide Market Size, Tanneries, Technical Grade, Textile Industry, water treatment.